Please try entering https://graph.facebook.com/330789877094069/photos?fields=source,link,name,images,album&limit=200 into your URL bar and seeing if the page loads. Veteran’s Day is nearing and it is a time when we, as a program, recognize and remember all the acts of valor performed by all service men and women. These individuals have and continue to serve our great country. Each week during the fall, we have the privilege and freedom to go out and play the game of football. The freedom that we have obviously comes at a price that so many families and service members understand all too well. In recognition of the great sacrifices so many have made for our life and freedoms, the Calvert Football program would like to say thank you. 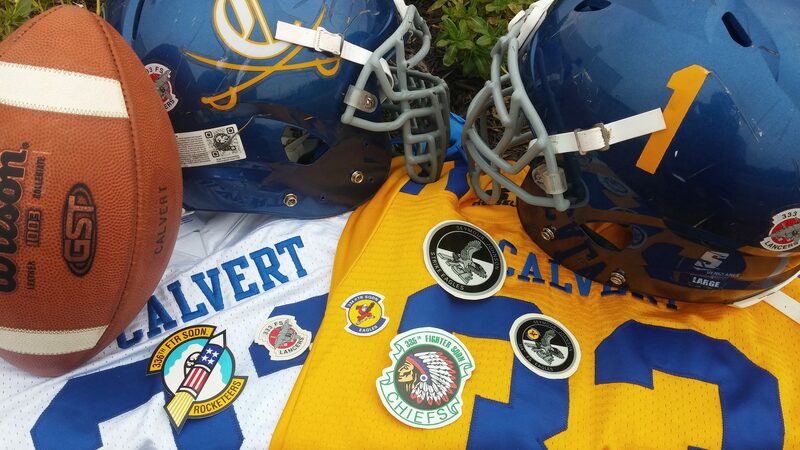 In honor of veteran’s everywhere, Calvert Football has been given the great opportunity to represent the Air Force’s 4thFighter Wing, by wearing each of the squadron’s logos on our football helmets. The 4th Fighter Wing can trace its origins to the Royal Air Force (RAF) Eagle Squadrons of World War II. The RAF Eagle Squadrons were formed with volunteer pilots from across the United States. The last Eagle Squadron was disbanded in September 1942, with most of the members transferring into the United States Army Air Forces, primarily the 4th Fighter Group of the U.S. Eighth Air Force. Many famous fighter aces came from this elite group. The 335th and 336th Fighter Squadrons are capable of deploying worldwide on short notice and immediately generating combat power, while the 333rd and 334th Fighter Squadrons are responsible for training all F-15E Strike Eagle aircrews for the U.S. Air Force. These elite members are not only honored on Veteran’s Day, they are also honored and never forgotten, in the hearts of our Cavalier Nation!! Thanks to all who have or still serve this great nation we live in! !